The shorter days have arrived and I am now back to carrying my lights. I will get fresh batteries today as my main lights don’t look as bright as I would like. These lights have done well for the year. I will throw out my cheap lights because the cost of battery replacement is more than the cost of the light but they did last for over a year. I got a spare set when I found this out. I've bought a red Fibre Flare. Expensive and quite big to haul around, but boy does it show up in the dark! You might want to consider the Brompton light set. The front light is a very good and bright LED. 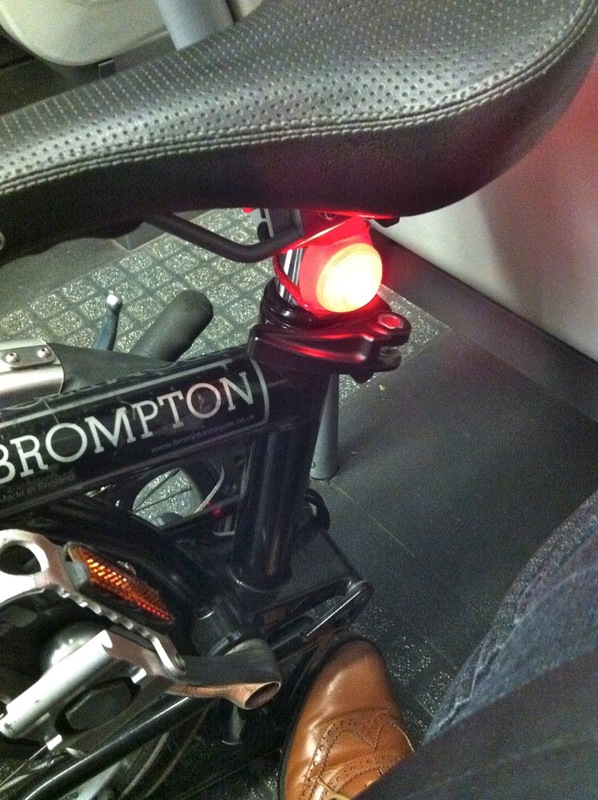 The rear is a Brompton branded light that stays fixed just above the rear mudguard. As I am thinking of upgrading next year I will put off getting another Brompton light set. I am still smarting from the failure of my Brompton dynamo lights. Those Fibre Flares look very interesting but expensive. Yes I did have an older version and other people have since told me that they are now much better. I recomend one (or two) Smart Polaris Super Flash 1/2 Watt LED lights. Cheapish (about £10 or less), insanely bright*, and lasts for ages on a couple of AAs. I have a couple on my M6R one underneath the saddle and one on the back of the rack. *so bright that looking directly at them is not an option, and easily visible even in bright sunlight. I will look out a rear light. I like a bright light. If you haven't looked at Nite Rider lighting systems I highly recommend them. The Nite Rider Macho 2 watt headlight delivers both a wide beam (some 15 ft I'd guess and a bright center light). I've also got their Cherry Bomb light for the tail light. That really is annoying to loose your lights right now when you need them most. It also just confirms that I will not be getting dynamo lights in the future. Too expensive if they are only going to last for year. Even you get them repaired for free you have to live with the worry that they may go again and so you still need spare lights.